Prepare the Taco Filling: Clean brisket by trimming off excess fat, cut into 5-inch pieces, and season with salt and pepper. Heat canola oil in a large, heavy-bottomed, stainless steel pot over medium-high heat. Add brisket to pot and sear each side until meat is deep golden brown. Once browned, remove brisket from pot and set aside for later. In a separate large, heavy-bottomed, stainless steel pot, sauté onions and garlic until translucent. Add tamarind paste, chipotle peppers in adobo sauce, TABASCO® Chipotle Sauce, bay leaf, brown sugar and water and bring mixture to a simmer. Once brown sugar has dissolved within mixture, add reserved brisket to pot, cover with aluminum foil and simmer 3 hours or until tender. Remove brisket, shred and set aside. In a food processor, blend remaining liquid and then combine with shredded brisket in a bowl or pot until ready to serve. If preparing the day before, let shredded brisket and liquid cool before placing in fridge overnight. Re-heat in a large, medium- to heavy-weight stainless steel pot before serving. Prepare the Taco Topping: Mix red onion, lime juice and habanero peppers in a bowl; season with salt and allow to sit 1 hour. 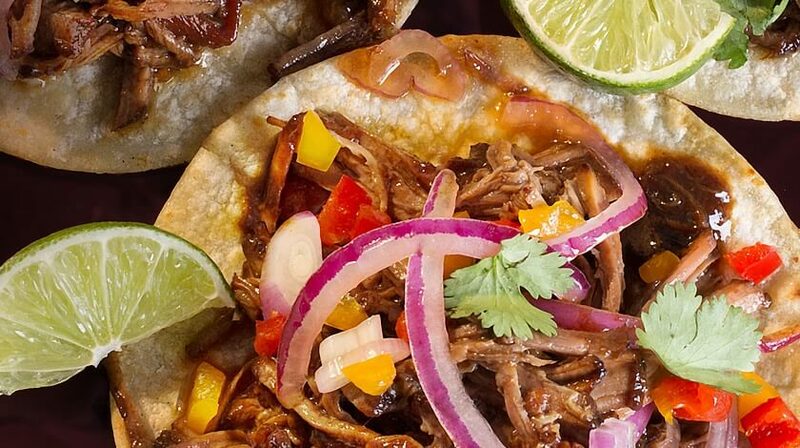 To serve, build tacos by adding heated brisket to a warm fresh corn tortilla and top with onion mixture and cilantro leaves, as desired. A smoky, flavorful sauce. Pairs well with any BBQ dish.